The internet is all about connection, and if your website is successful it will do just that. Your site’s main objective is to connect with your customers, and for them to connect with you. If you’re just getting started in creating a web presence, think of your website as a business card. Unless you’re selling your product directly online, you’ll likely want your website to be the first step in your customers contacting you. This will probably happen by phone, email, or in person. About.me is a forerunner in helping people setup “online business cards”. Check out some examples on their site (or check out this guy’s page). About.me let users create a business card in less than 5 minutes. Boom, basic website. When I’m designing a new site for a business and need a simple “coming soon” page during development, I’ll put a similar page up. Phone number, email address, physical address, store hours. The essentials. If customers could do only one thing on your website, what would that be? Of course you’ll want them to browse galleries, learn all about your interests, and read your clever anecdotes on your blog ;), but if you had to strip it right down, what would you want them to do? Get a quote? Give you a call? Share your video? This is the first thing that you should focus on on your website. Even as your site grows to meet your growing needs, this main thing needs to stay at the forefront of your mind. 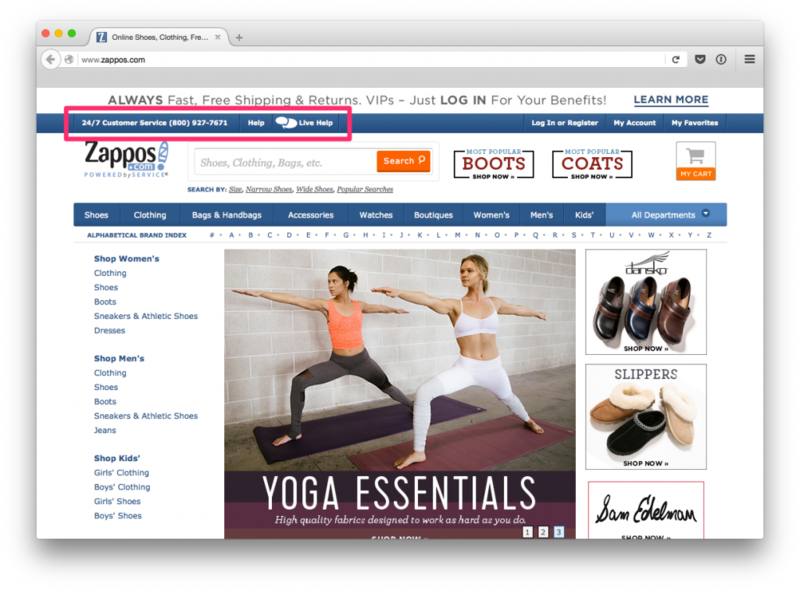 Zappos is an online shoe store. Their website is filled with information, pictures, but the main thing they sell is service. Unlike most online stores, they actually want to talk to their customers. Because of this focus, they’ve always made their phone number one of the first things that loads on their website, right above the their logo. Even though their site is thousands of pages large, the focus is still to connect with their customer. Determine your website’s core function now, while it’s small. Once that’s set, you’ll have a core you can build onto down the road.